Recent release “Grandma's Story of Georgie the Rooster Goose” from Page Publishing author Annie Hernandez is a bright and charming story of a strange and unusual baby rooster hatched and fostered by a mother goose. Annie Hernandez, a devoted writer and author, has completed her new book, “Grandma's Story of Georgie the Rooster Goose”: a fun and unique tale of a lost egg who finds a warm home with a mother goose and her brood. Published by New York City-based Page Publishing, Annie Hernandez’s enchanting tale follows a little white chicken egg who is lost from its mother. In order for the egg to hatch, it must be kept warm. So it is placed underneath a mother goose with her eggs. After a few days, a baby chicken rooster is hatched. However, this particular rooster chick is rather strange and unique. 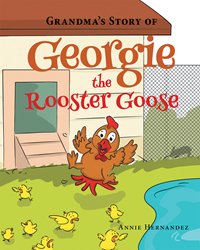 Join little Georgie the rooster goose as he explores and embarks on an adventure. Readers who wish to experience this heartwarming work can purchase “Grandma's Story of Georgie the Rooster Goose” at bookstores everywhere, or online at the Apple iTunes store, Amazon, Google Play or Barnes and Noble.